Sounds pretty good. But even as the economists purred over the job gains, they noted that wage growth was still quite soft. The reports, as per usual, focused on the minutiae of month-to-month changes in employment across different industries and among full-time and part-time workers, many of which were not statistically significant. It's rare for economists who face the daily grind of reporting on every economic indicator to step back and look at underlying trends inside the labour market. But doing so helps explain some seeming anomalies and overall paints a less rosy picture of labour market. While employment was up 1.5% in 1Q17 on a year-over-year basis, total hours worked by those employees at their main job was actually down 0.1% (even with a sizeable jump in hours worked in March). Main jobs are the source of the vast majority of Canadians income from work. Some, who cannot make a living wage at their main job, take on second or third jobs to supplement their incomes. Apparently, more people have had to take on extra jobs over the past year, as total hours worked at all jobs were up 1.4% in 1Q17. 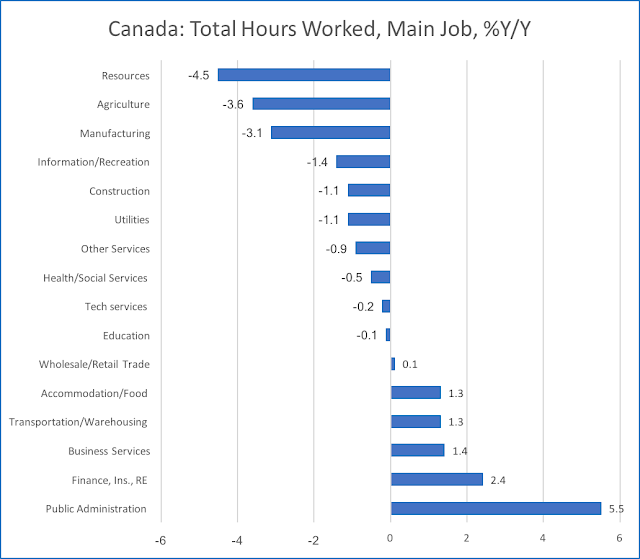 When we look at hours worked on main jobs by industry, we find that several key industries with high-paying jobs have seen substantial declines in hours worked, while other industries with low-paying jobs have seen increases in hours worked, as shown in the chart below. The biggest declines in hours worked over the past year have been in the resource sector, especially in the oil and gas industry. Manufacturing, construction and utilities have also seen substantial declines. Large employers like health and social services and education have seen small declines. At the other end of the spectrum, decent gains in hours worked have occurred in accommodation and food services, transportation and warehousing, business services (which includes waste management) and finance, insurance and real estate. By far the largest gain in hours worked over the past year has been in public services (i.e. federal, provincial and municipal governments). When one sees these changes in hours worked, it becomes much less of a mystery why wage growth has been weak. According to Statistics Canada's Labour Force Survey, the average hourly wage earned by employees at their main job was C$26.12 in 1Q17. 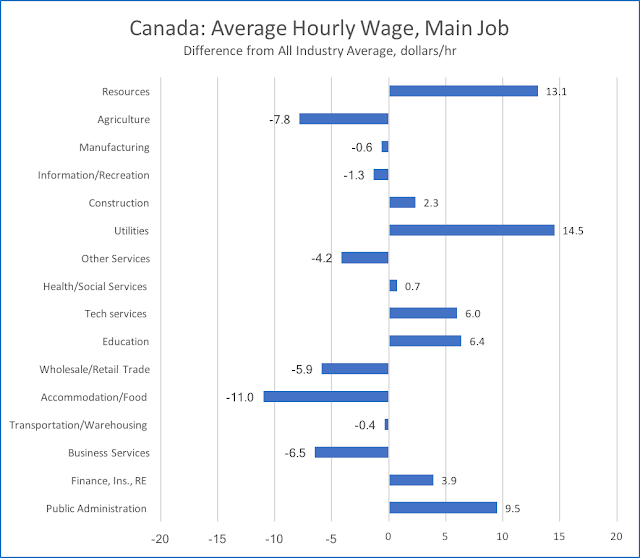 But some industries paid much higher (or lower) hourly wages than the average, as shown in the chart below. The resource sector, which experienced the biggest decline in hours worked, was the industry with one of the highest average hourly wage rates, over $13 per hour higher than the Canadian average. The utilities, construction, and education industries, which also pay above average wages all saw declines in hours worked. In contrast, the accommodation and food services industry, which pays the lowest average hourly wage -- $11/hr below the national average and $24/hr less than the resource sector -- was one of the industries which saw a meaningful gain in hours worked. The wholesale and retail trade, transportation and warehousing, and business services sectors, which pay below average wages, also saw increases in hours worked. The one anomaly is the public sector, where hourly wages are high and hours worked posted the largest increase of any sector. It seems clear that Canada is experiencing decent total job growth, but that total hours worked for employee's main jobs have been flat, with high-wage industries reducing hours worked, low-wage industries increasing hours worked. This is not a sign of a healthy labour market. If I had to come up with a story to explain the labour market developments of the past year, it would go like this. The collapse in the world price of oil, which began in mid-2014, resulted in a dramatic declines in hours worked in Canada's resource sector in 2015 and 2016. Declines in energy-related activities spilled over into the non-residential construction, utilities and manufacturing industries. These declines were probably magnified by a tightening of environmental regulations which stalled pipeline construction and carbon tax proposals by governments concerned with global warming. With weakness in key sectors of the economy and new left-of-centre governments in Ottawa and some provinces, hours worked in governments shot up. The sharp weakening in Canada's former industrial growth drivers triggered two 25 basis point policy rate cuts in 2015 and a 20% depreciation of the Canadian dollar relative to the USD. With interest rates falling to rock-bottom levels and the currency cheapening, housing prices in Canada's most cosmopolitan cities -- Vancouver and Toronto -- became extremely attractive to both foreign and domestic purchasers and the real estate industry boomed as the house price bubble inflated. The weakening of the currency made foreign travel more expensive for Canadians, while at the same time making travel to Canada less expensive for foreigners, benefitting the transportation, accommodation and food service industries. So, while many economists look at Canada's job gains over the past year through rose-coloured glasses, I see the changes occurring in Canada's labour market as signs of weakness in the the Canadian economy. More Canadians are forced to work multiple jobs to make a decent living. High-paying jobs are harder to find. Employment gains are concentrated not in a thriving private sector, but in low paying industries benefitting from a cheap currency, in a bubbly and unsustainable real estate sector, and in activist, meddlesome governments. Thanks Arijit. Labour market internals are more informative than the headline numbers.